An evergreen perennial related to lillies. It has strappy, green leaves and erect stems of bell-shaped, purple flowers. 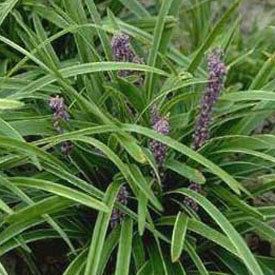 Liriope can be used as a groundcover under trees and shrubs and as a massed planting on slopes and banks. It can also be used as low edging plants along paved areas or in front of foundation plantings. Limited stock. Note: this is not Mondo Grass, please see that listing for more information. Liriope is remarkably tough. It will grow in part shade, deep shade, or full sun, sand or clay. It can endure heat, drought and salt spray, but will not take "wet feet"; it requires moist, well-drained soil. Flowers are produced most freely in a sunny location.